The Agricultural Research Station was started in the year 1944 as a testing center for wheat. Later on, gram testing programme was added in the year of 1977 with some additional staff. In earlier days, objective was to evolve drought tolerant crop varieties and dry farming practices suitable for this region. Later on in December 1979, National Agricultural Research Project came into existence with the help and aid provided by International Development Association (IDA) in affiliation with the International Bank for Reconstruction and Development (IBRD) with sole objective to improve crop productivity of salt affected soil under erratic pattern of rainfall and harsh climatic conditions. The research work at this NARP center is covered under various disciplines such as, (1) Soil Science and Agricultural Chemistry, (2) Agronomy (3) Plant Breeding, (4) Entomology, (5) Plant Pathology, (6) Agricultural Extension, (7) Agricultural Engineering and (8) Plant Physiology. Since the post of Physiology has been withdrawn from the center so as research work on Plant Physiology is not carried out at present, the sole objective was to find out solution to various crop productions related constraints of the Bhal and Coastal Zone through multidisciplinary location specific research. 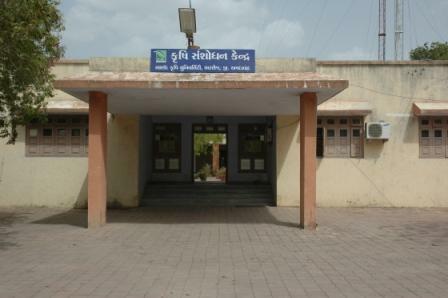 This station was the Head quarter of the Bhal and Coastal Agro-climatic Zone i.e. Zone VIII of the state with two sub-centers viz; Agricultural Research Station, Dhandhuka and Dry farming Research Station, Vallabhipur, which were conducting research work mainly as supporting and testing centers on the need based problems of this zone pertaining to development of crop genotypes and release of crop varieties suitable to this agro-climatic zone as well as to increase the production and productivity of the crops in the zone for the betterment of the farming community of the zone. This center, being the Headquarter of Bhal and Coastal Zone, used to enjoy the status of Regional Research Station. To co-ordinate, cater as well as to guide in all kinds of multidisciplinary research activities of the entire zone, one post of Associate Director of research was functional from the main research station Arnej..
With the dissolution of Gujarat Agricultural University with simultaneous inception of four Agricultural Universities in the state, Arnej center has been placed under the newly formed Anand Agricultural University and within a short time the post of Associate Director of Research has been abolished from the center with simultaneous degradation of status of this center from Regional Research Station to a merely Agricultural Research Station. The center is situated 13 km away from Bagodara (Ahmedabad- Rajkot NH 8) on Bagodara-Tarapur State highway and 75 km away from Ahmedabad city and exists in Bhal and Coastal Agro-climatic Zone VIII of Gujarat State. Mode of Travel to reach the center: (Distance from Railway station / Bus stop). By walking, local transport, Univ. vehicle (if available) (about 3 km from both Railways & Bus Stop).